There’s still time to leave the cooking to the pros. Feel like out-sourcing the job? Here’s who we would turn to for takeout versions of breads, sides, whole turkeys, and desserts. As thrilling as it can be to spend hours, if not days, plotting out and preparing Thanksgiving dinner, it takes a lot of time and energy. Pastry chef Alex Levin’s annual holiday pop-up now has three locations (Alta Strada in DC and Fairfax and Casolare in DC’s Glover Park). He’s offering both sweet confections (vanilla-bean cheesecake with a brownie base, $32) and savory baked goods (Italian turkey-sausage stuffing), along with breads. All proceeds benefit a Youth Friendsgiving Dinner hosted by SMYAL, an organization supporting LGBTQ youth. Order by November 19—delivery is available for an extra fee. There are ten pie flavors ($42 each) on offer at this Georgetown sweets shop, including cherry, apple/cranberry/crumb, and chocolate/oat/caramel. For breakfast, there are pumpkin doughnut muffins ($18 for six) and whole quiches ($39.60). Order them here. David Guas’s Louisiana-accented cafe is dishing up sides of dirty rice ($15 per quart), buttermilk biscuits ($12 to $20 per dozen), and pimiento cheese ($12 per pint; $20 per quart). The pastry chef is also doing pies in flavors like Virginia peanut ($20), roasted sweet potato ($24), and lemon chess ($24). Order by November 19 (if you order before November 15, you get 15 percent off). The elegant American dining room is doing a dinner package ($425) for six to eight people that includes a 10 to 12 pound roast turkey, sides like braised greens with white soy and pimento mac ‘n’ cheese, fresh breads, and apple and pumpkin pies. A cheese and charcuterie plate is $75 more. Order by November 14. Robert Wiedmaier’s Belgian/French brasserie is offering a package deal: a traditional Thanksgiving dinner for eight to ten people ($295). The spread includes roast turkey, wild-mushroom/chestnut stuffing, and an apple tart. Order before November 18. Japanese potato mallow pie, with a toasted-rice/buttermilk souffle center, at Brothers and Sisters. Photograph courtesy of Brothers and Sisters. 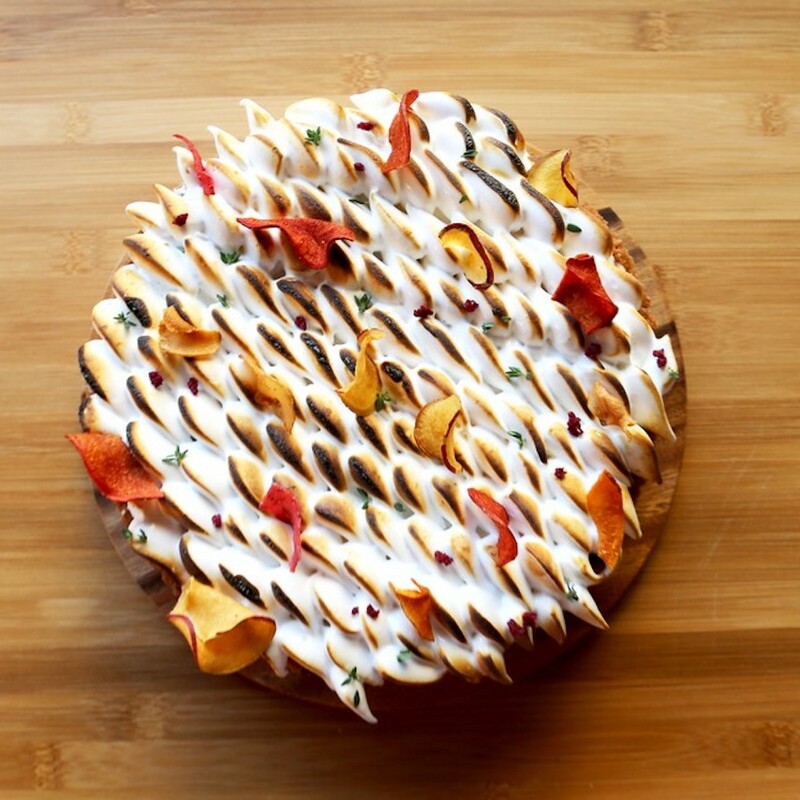 James Beard-nominated pastry chef Pichet Ong serves up three eye-catching pies: Japanese potato with a rice cracker crust and thyme-scented marshmallow; pecan/chocolate; and salted caramel apple ($50 each). Order here, and pick them up at the restaurant in Adams Morgan’s Line hotel. Amy Brandwein’s CityCenterDC Italian spot is offering a traditional spread with some Mediterranean accents. Pick up creative antipasti platters ($60 each); whole chickens ($22); and lots of sides ($12 to $48), including Brandwein’s mother’s rosemary/sage stuffing. For those willing to do a little work, uncooked cider-brined turkeys ($8 per pound) are available, too—they come with cooking instructions. Order before November 18. Hit these twin Cuban cafes for a few desserts: rum cake ($18), coffee/pecan pie ($27), and pumpkin/dulce de leche pie ($27). Cedric Maupillier’s French-American restaurant in Shaw will dish up turkey, six traditional sides, and your choice of one of four pie flavors for $35 per person. Orderbefore November 18. Looking for Thanksgiving on the fly? This French/American CityCenterDC bistro is serving roast-turkey sandwiches ($15) to go. The focaccia stacks come adorned with with sage aioli, cranberry marmalade, and chestnut stuffing. At this Mount Pleasant cafe/dining room, one of the year’s top newcomers, you can order full turkey dinners for four people ($120) or a la carte dishes portioned for four, six, or eight. On the menu: sourdough stuffing, creamed corn, and a selection of cakes and pies. Order by November 16. Doron Petersan’s bakery/diner has vegans covered. Pick up a dinner for four ($80) that features chickpea/seitan cutlets, truffled green beans, and wild-rice stuffing (among other sides). Pumpkin, maple/pecan, and apple pies range from $25 to $44. Order by November 18. The Dupont Circle locavore market is offering uncooked organic or cage-free turkeys ($3.29 to $5.29 per pound), cheese and charcuterie plates ($45 each), and ready-to-heat sides like sage/sausage stuffing ($19.99) and roast garlic whipped potatoes ($19.99). Order turkeys by November 16, and other items at least three days in advance. Although the popular ice cream shop is closed for the actual holiday, you can pick up their autumnal flavors in advance. Pints of apple butter/oatmeal cookie, sweet potato/molasses candy, and cranberry sorbet would fit right in at the Thanksgiving table. The Dupont Circle restaurant is offering Mediterranean dips, breads, and desserts. They include spicy feta dip ($6 per half pint), kalamata-and-grape focaccia ($16), and a traditional Greek semolina custard with a hint of cranberry. Order by November 19 (email manager@irongaterestaurantdc.com). The Del Ray bakery is serving up quarts of butternut-squash soup ($12), cranberry sauce ($8), four traditional pies ($25 to $27 each), and of course, loaves of bread ($5 to $12) for next-day sandwiches. Order before November 18. The steakhouse’s pastry chef is baking seasonal pies ($19 each) in flavors like blood orange/pecan, lemon chess, chocolate silk, and cinnamon/Granny Smith apple. Order them here. Chef/owner Ris Lacoste has a wide selection of starters, sides, desserts, ice creams, and vinaigrettes. Look for crab cakes with with mustard crème fraîche ($40 per dozen); Thai Brussels sprouts ($16 per quart); and bourbon/chocolate/pecan pie ($30). Order by November 18.